The Greek wine world was shocked yesterday when terrible news of Haridimos Hatzidakis loss spread quickly through social media. 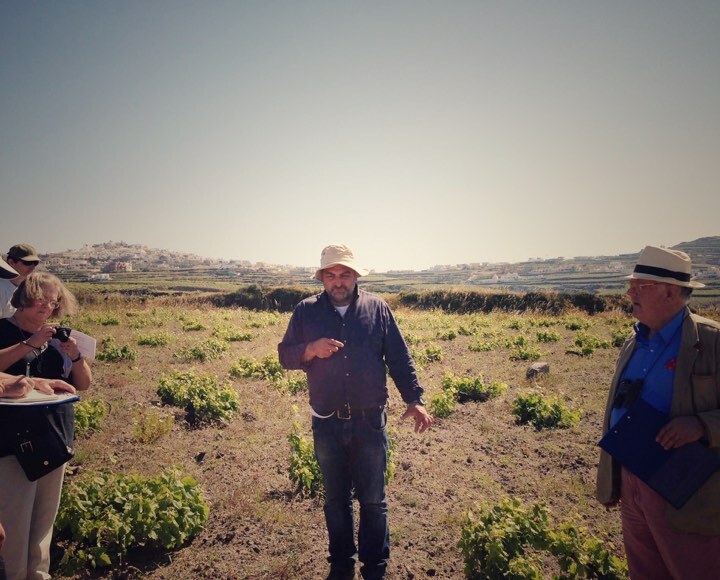 Hatzidakis, one of the top producers of Santorini and a leading light for Greek wine left prematurely this world during the harvest 2017 that started few days ago. I first met him during the visit of the Institute of Masters of Wine in Greece four years ago and I was impressed by his passion for making great and more importantly authentic wine. His favourite vineyard had to be Mylos where I took the picture above. Just few days ago I interviewed him about the health of Assyrtiko grapes and how the extremely hot conditions of June had affected them. Always polite and humble, very sensitive, innovative with his winemaking philosophy he was responsible for some of the most fascinating Santorinian wines ever produced. Assyrtiko de Mylos, Assyrtiko de Louros and Cuvée 15 all do make their statements for their individuality possessing Haridimos fingerprint. A big supporter of organic viticulture and natural winemaking he was an inspiration for all those wishing to express terroir in their wines. Farewell Haridimos, my deepest condolences to your family. Your legacy will live on.